~ Recently, we rediscovered fragrant, summer ripened peaches. But I hadn’t made peach jam. 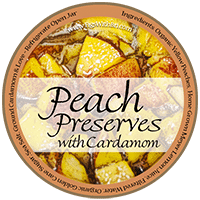 Not one for plain, ordinary cooking, did a bit of culinary research to see which liquors and spices meld with peaches…and cardamom caught my eye. 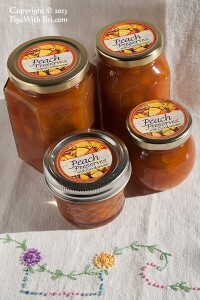 The Peach Cardamom Preserves filled the house with an amazing aroma as it was cooking! The jam might be very nice, slightly warmed, then drizzled over muffins, pancakes, even a bowl of oatmeal. INGREDIENTS: Organic Peaches, Home-grown Meyer Lemon Juice, Filtered Water, Organic Golden Cane Sugar, Sea Salt, Ground Cardamom & Love. These preserves are delicious. I had them on crackers and they made a wonderful treat. As I bit into the chunks of peach they taste like they are fresh peaches. This has enough sweet to make it delicious but not so much to over power the flavors of the fruit and the cardamon.